November! Instead of doing a list of goals for writing, I decided to do something else this month.... and for the first time, I challenge you to do the same! Have you ever stopped to take an inventory of your blessings? Watch this little clip below. Blessings... I definitely don't think I take the time to thank God for my blessings and I really do have a lot of blessings. I need to take my Thanksgiving Inventory. So, that's what November is about! Instead of focusing on "I need to buy presents and make sure that I've got a list prepared for everyone who wants to buy me a gift", I am going to be thankful for what I've got. 3. Share this challenge with a friend to see if they can think of something to be thankful for! 4. 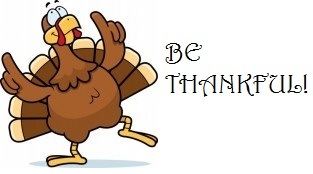 Enjoy the thankful Turkey image and add him to your post! Does that sound fun? Did I mention that there is a prize for the person that is most thankful? Okay, there's not a prize, but you might get at least one new follower (Me, if I'm not already following you) and you really get to enjoy the month of November! This is a wonderful idea for a blogfest! Sounds like a lot of fun and meaningful as well. You know, blessings tend to be taken for granted. It's good to sit down once in a while and take stock. It can be shocking how much "inventory" we actually have...and so much more to come. What a great fall blog idea!! Thank you ladies, I hope that you join! It's really a great thing to remember what we are thankful for. Rereading Books - Problem or Not? How do Moms do it?